UPDATE: New Motorola Xoom tablets priced to undercut iPad 2 | What Hi-Fi? Prices start from £330 for the smaller Xoom 2 Media Edition, while the larger Xoom 2 wi-fi model (16GB) will set you back £380 – undercutting Apple's cheapest iPad 2 by £20. 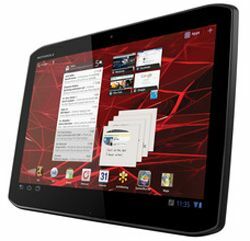 Powered by the latest Android 3.2 OS, the two new tablets are due out in the UK later this month. The Xoom 2 has the same 10.1in format screen as the original Xoom, while the Xoom 2 Media Edition has a smaller 8.2in screen. Both have a 1.2 GHz dual core processor, 1GB of RAM, 16GB of storage, a 5MP camera on the front and . The Xoom 2 offers a 10-hour battery life compared to the Media Edition's 6 hours, and weighs 599g compared to the smaller Xoom's 386g. Motorola claims the new Xoom tablets will deliver better graphics for gaming, as well as being thinner, lighter and faster. The two tablets are due out later this month.